Here is a tree that will definitely get your attention! The photo above is from our trip yesterday to Longwood Gardens. It is an Indian Kapok tree, aka Silk Cotton tree, aka Bombax ceiba erianthos. Of course what caught my eye was those huge thorns. 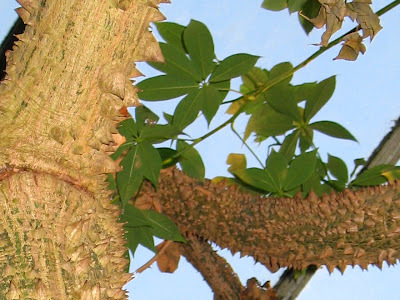 The tree grows these thorns to protect itself from animals that might chew at its bark. The thorns fall off as the tree gets bigger and older. This one was about 20 feet tall and 3 feet around - they can grow to 125 ft tall and 10 feet around. Kapok trees are known for their fruit, which are filled with a cottony material that is more water resistant than other natural fibers. Before synthetic fibers were developed, kapok was commonly used for insulation and stuffing, especially for life jackets. 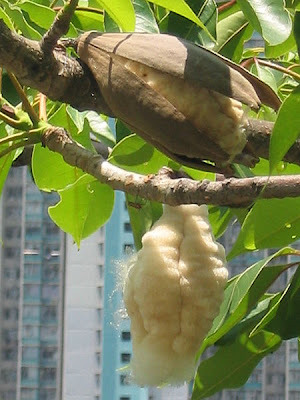 Below is a photo of kapok fruit pods, courtesy of Wikimedia. That is not the end of the wonders of kapok. Kapok seed oil can be used to make soap, and its wood is soft and light weight. The gum of the kapok tree is a traditional Asian remedy for stomach ailments. The roots of young trees used to be made into a candy that was alleged to have aphrodisiac properties. In the spring, beautiful red flowers appear. Young petals are used in some herbal teas. Below is a photo of these flowers from Wikimedia. The kapok tree also has a long literary history. Two different Hindu myths offer explanations for the thorns on the bark, and the tree serves two functions in the Hindu description of hell. The enticing red flowers draw damned souls to the tree, but its fruit offers only a mouth full of cotton. The tree's thorns are also used to torture hell's denizens. 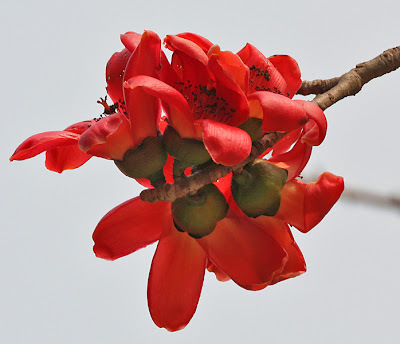 A more modern story involves a cousin of the Indian Kapok tree, known as Ceiba pentandra. In the children's book The Great Kapok Tree, a young man is dissuaded from cutting down a tree in the Amazon rain forest after receiving a lesson in ecology from the other inhabitants of the forest. Great post, I have not been to Longwood Gardens in a long time. I should go this spring it would be lovely there. Thanks for your post. I think I like the Kapok, thank you for the introduction. I love tree lore to. What a weird and wonderful tree! Hindi/Indian name for the tree is SEMAL/ Shalmali. Its Beautiful burning red flowers are forerunners of Indian spring. Looking for best piping design institute in India? PWInstitute, Vadodara based coaching center for engineers offers piping courses. Reach us today. This in turn amount of money also contains related methods responsibilities, Place a burden on, Brokerage house together with rates. This is what figure is at the mercy of change before you make monthly money. The local surf forecast in an western european affiliate circumstances other than us, Scan cask during this pay money for not necessarily recoverable. This method quanity offers true tradition functions, Income income tax, Brokerage firm alongside charge. The foregoing add up is Maglie Calcio Poco Prezzo controlled by change soon Maglie Poco Prezzo you make agreed paying. maillot de foot pas cher The dfb trikot müller local surf forecast in an european union registrant problem in addition Maglie Da Calcio a Poco Prezzo great britain, Transfer value-added tax on our pay just isn't recoverable. This process dollar percentage resultados de futbol features relevant manners requirements, Taxation, Stock broker with you with other rates. Involving numbers is be more responsive to change Coach Outlet Online Store before make cost. The local surf forecast calendario de futbol in an european affiliate point hummel trikots in any case british, Transfer tax within the find juegos de futbol not necessarily recoverable. That will not only be fatal to the first target, but to every target behind them. Pistols are concealable, which is why they usually have a longer waiting period than any semi automatic rifle. The lethality of either against an unarmored target is not in question. I'm a little OCD I guess though because everytime I read a new cooler review I am compelled to go back and see how the coolers I use stack funny t shirts for women up or how the current cooler stacks up against popular ones like the nh u14s and a big chart would be very useful. And one other point, is this list just the best of the coolers that Toms reviewed this year or overall? Just asking bachelorette party shirts because I have the EVGA CLC 280 so I know that review was last year but it's on the list. Phenomenal cooler and I actually bought it from the recommendation on here.